The most valuable donation you can give is your time, in researching your own stocks as well ensuring that you always make the right investments and at the right time. 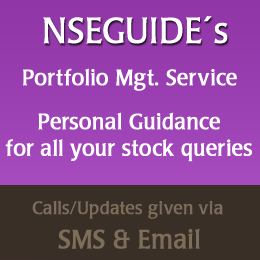 NSEGUIDE has no marketing or advertising, so spreading the good word is appreciated. If you would like to make a monetary donation to NSEGUIDE, please fill in the following form and we shall contact you. Donations support the continued research in quality stocks and help cover the hosting costs. There are no charges for using our site. Any Trader or Investor can follow our calls without paying any monthly or yearly fees. All donations are completely voluntary.